An original 52 week street photography project. I traveled into NYC every Monday for 52 Mondays in a row to do street photography. I share photos and commentary about the journey. Synchronicity & coincidence stories and thoughts about the law of attraction that remind us that the Universe has a great sense of humor and is orchestrating magic behind the scenes constantly. Continuing the journey, I share street and landscape photos from various cities and towns I visit. 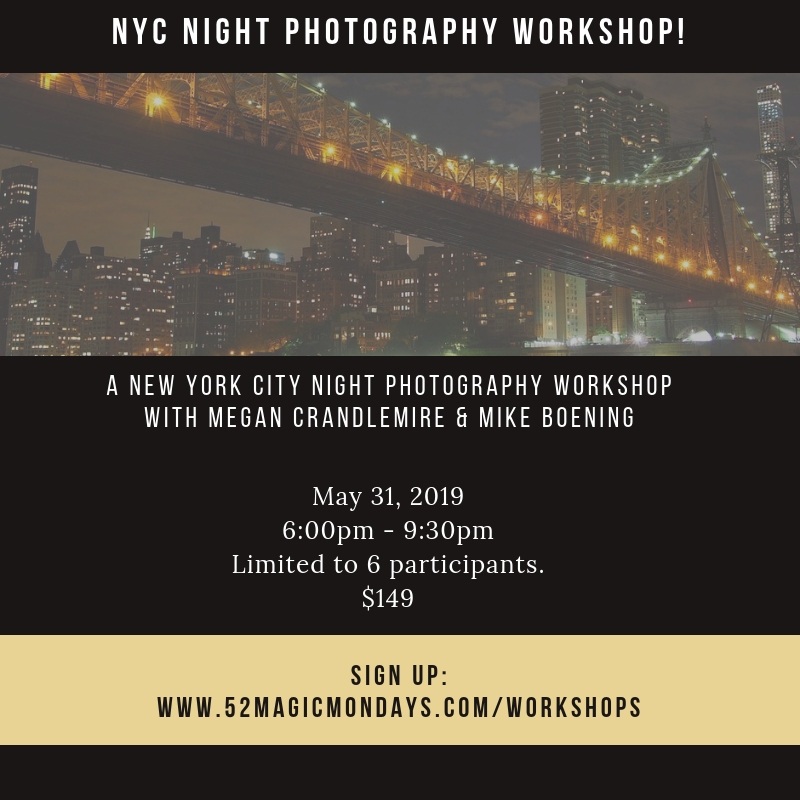 June 1 & 2, 2019 NYC Photography Workshop! 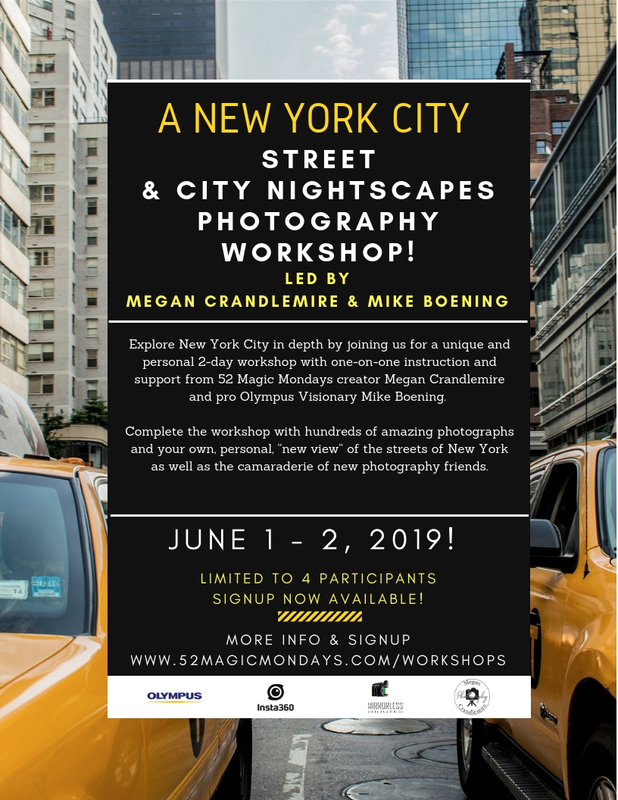 Mike Boening, Olympus Visionary and I are excited to announce our Spring 2019 Street Photography Workshop in New York City! June 1st & 2nd...click link for more details. Only 4 spots available. May 31, 2019 Night Photography Workshop! I am hosting a night photography workshop in NYC on May 31, 2018. Click the link for more information and to sign up! Only 6 spots available. I give visual presentations about my 52 Magic Mondays journey, the ins and outs of street photography, and the power of personal projects. I'm available locally or can travel to you anywhere in the country. I host individual and small group street photography workshops, too! See my Workshops page for more information. I'm also available for one-on-one phone consultations and portfolio reviews. Need a headshot or family portrait? Visit my website for more information about my photography services. My name is Megan Crandlemire and I'm a spiritual seeker. I'm also a photographer, writer and speaker. In 2016, I ventured out on a year long photography project called 52 Magic Mondays that changed the direction of my life. I continue to photograph cities and post photos in my new project called 52 Magic Metros. You can buy prints of my work in my Fine Art America store. It is now my pleasure to share my daily interactions with the Universe in 52 Magic Musings, for those who are seeking relatable stories and information for their own personal journey. If you're reading this, law of attraction has brought you here for a reason. Have fun figuring out why! Reach out to me anytime. I found the teachings of Abraham-Hicks on the topic of Law of Attraction in 2018, after I lived out an amazing 10+ year journey seeking answers to the big questions in life like "who am I" and "why am I here." I've received so many answers for myself. You can, too! The teacher appears when the student is ready. My teachers have been many, but I learned the most through my own (wild at times!) personal experiences with the Universe. Words don't teach, but they can nudge you along to open yourself up to receiving the answers you are seeking. Once you KNOW, you just know.